These Baileys Irish cream brownies are rich, fudgy and full of Baileys flavor with 3/4 cup in the batter and the ganache! Can be made with whole wheat, all-purpose or buckwheat flour for a gluten-free version. I don’t know about you but I skip over all that dyed green stuff* for St. Patrick’s Day and head straight for the Irish cream treats. My only issue with alcohol containing desserts is that they’re usually not boozy enough for my taste. I’ve said this a dozen times but I don’t like subtle! *Okay, I put on some sprinkles for one of the pictures here. 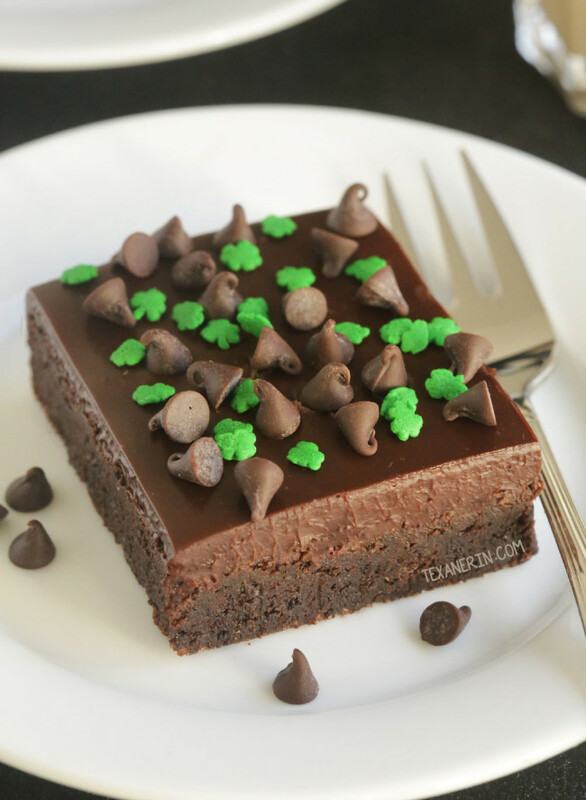 These Irish cream brownies were something I made for My Baking Addiction and I wanted them to be festive! I usually use the same brownie base whenever I make brownies these days, but the problem with adding a bunch of Baileys to my best gluten-free brownies is that it’d totally throw off the wet to dry proportions in the recipe. I’ve made Irish cream cheesecake brownies in the past but wanted to use more than 2 tablespoons of Baileys in the batter. I need more! So instead of a cocoa powder only based brownie recipe, I came up with a cocoa powder and chocolate based recipe, thinking that the melted chocolate would require the addition of some more liquid. The result? There’s 1/2 cup of Baileys in the batter! They definitely have a nice, strong Irish cream taste to them. If you use buckwheat flour, the Irish cream taste is quite a bit more subtle than the whole wheat or all-purpose flour versions. If you don’t want to compromise on the Baileys taste, use your favorite gluten-free all-purpose flour like this one. I haven’t tried that flour in this recipe but I’m pretty sure it’d work, as it’s worked in everything I’ve tried so far. So because I wanted the buckwheat version to also be nice and boozy, I made a ganache topping and replaced half of the whipping cream with Irish cream. Yay. :D I don’t think there will be any complaints of, “Not boozy enough!” when you bite into these brownies. For another Baileys and chocolate dessert, try this Baileys Mocha Mousse from A Mind “Full” Mom! I love that it uses Greek yogurt. They’re also super rich with that ganache. If you’re going to use it, you’ll probably want to cut these brownies into smaller squares than you normally would! Because Baileys has cream in it, I didn’t bother with dairy-free options but if you feel like experimenting, you could try using this homemade dairy-free and vegan Irish cream. You’d then need to use dairy-free chocolate and coconut oil / milk instead of butter and whipping cream. One last thing – if you need these brownies to be gluten-free, please read this information about gluten-free Irish cream before deciding which brand to buy. Preheat the oven to 350 °F (175 °C) and line an 8"×8" pan with parchment paper. In a medium mixing bowl, stir together the flour, cocoa powder, salt, and baking powder. Set aside. In a medium saucepan over medium-low heat while stirring frequently, melt the butter and chocolate chips. Add the sugar, Irish cream, and vanilla and mix until well combined. Stir in the egg just until incorporated. Do not over mix. Fold in the flour mixture just until no more streaks of flour remain. It will be very thick. Scoop the batter into the prepared pan and use a silicone spatula to even it out. Bake for 15-17 minutes or until the top no longer appears wet. A toothpick inserted into the sides will come out with some moist crumbs on it, but not totally raw batter. The brownies will continue to bake as they sit in the pan. If you made the buckwheat version, let them sit for about 2 hours before serving as they need some resting time. Once the brownies have cooled, prepare the ganache. Place the chocolate chips and Irish cream in a small bowl. In a small saucepan over medium-low heat, warm the cream just until steamy and on the verge of simmering. Remove from the heat. Pour the cream over the chocolate chips and Irish cream and stir until all the chocolate chips are completely melted. Let cool for about 15 minutes before pouring over the brownies. Cover and store at room temperature for 2 days or refrigerate for up to 4 days. For fudgier brownies, refrigerate. Make sure your buckwheat is certified gluten-free, if necessary! 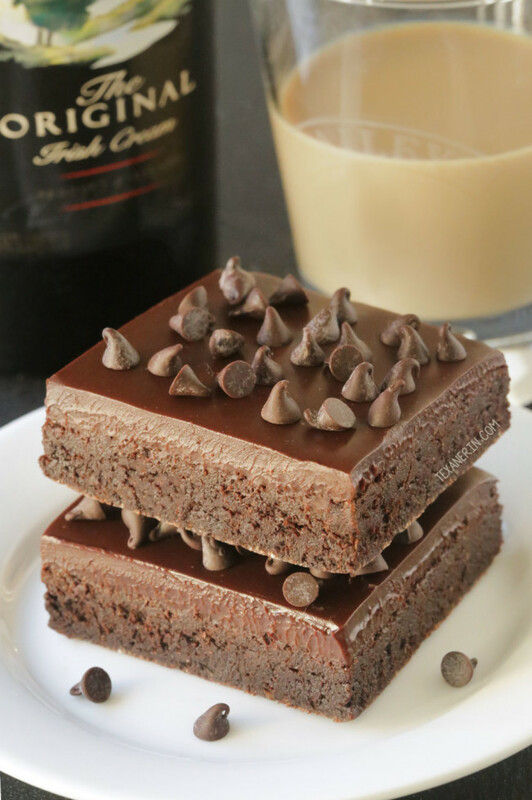 26 comments on “Baileys Irish Cream Brownies (gluten-free, whole grain options)” — Add one! Could you use any gluten free flour? I have a flax and whole grain all purpose gluten free flour which does contain some buckwheat flour and some other ingredients. I know from experience that the wrong flour can change the texture of the recipe. Hi there! Sorry for the slow reply. 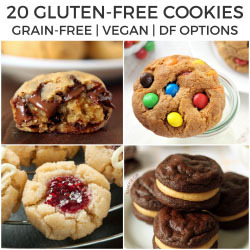 You unfortunately can’t use any GF flour as they’re not interchangeable with each other. If you have a GF flour mix that’s meant as a 1 to 1 sub for wheat flour, that’d probably work (though I haven’t tried it). Hope you’ll enjoy the brownies and sorry again for the slow reply! Can you substitute coffee with the irish cream? 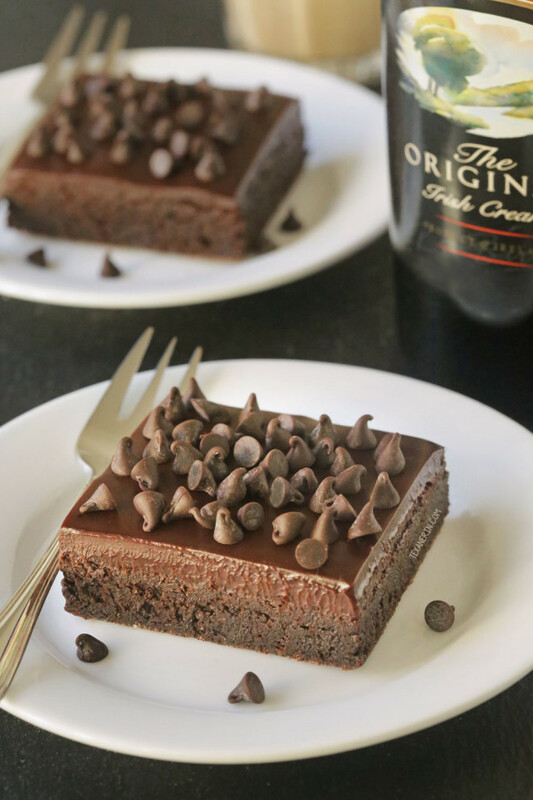 Not really a fan of alcohol but I’ve been looking for whole wheat desserts and this looks good! These are awesome and I love the little shamrocks. Great idea for Saint Paddy’s day. Thanks for the idea! I always love how you give options for your recipes so folks can tailor them to their dietary restrictions or preferences. These brownies look amazing, and it’s funny how they can really be dressed up for St. Patty’s day with just a few added sprinkles. Cute! Thanks, Renee! I try with the options. I just want as many people as possible to be able to make my recipes. :) Thanks a bunch for your nice comment! These brownies are calling my name! Absolute perfection!! I love brownies, particularly boozy brownies. I could eat ten batches of these. Thank you for not being subtle with the Bailey’s in the brownies and the ganache! You’re a girl after my own heart. These look fantastic! Now these are my kind of brownies. I love all the chocolate going on too. Yum! I LOVE these brownies! Looks so rich and creamy! Definitely trying this! I hope you will and that you’ll enjoy them as much as we did! 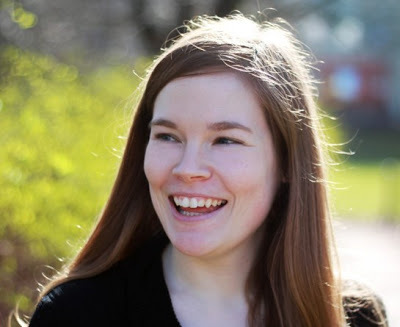 Wow, Erin! These sound heavenly! Perfect for St. Paddy’s! I’m swooning over the texture of that cake and ganache, WOW! Oh, yeah! Super rich, just the way I love dessert! And double the Baileys?! This is genius and glorious! YUM!